Jeff Weintraub: Why are Erdogan and the Gulenists slugging it out? Why are Erdogan and the Gulenists slugging it out? As the political crisis in Turkey continues to unfold, I've been trying to get some sense of the underlying causes of the escalating power struggle between Erdogan and the Gulenists which is one important component of this crisis. A post by David Pickering with some reflections on Turkey's political crisis pointed me to a piece in Al Jazeera by a Turkish journalist named Yavuz Baydar titled "Erdogan v Gulen: Zero sum game?" I've never encountered this Baydar person before, but his account is interesting and makes plausible sense (at least, in terms of capturing at least part of the background story). It's worth reading. The mini-bio for Baydar mentions that, among other things, he is a columnist for Today's Zaman—which happens to be a Gulenist-controlled newspaper. So I couldn't help wondering whether he was peddling a Gulenist line. (My impression is that a lot of the independent press, i.e. neither pro-AKP or pro-Gulen, has been shut down or intimidated into shutting up, leaving the Gulenist media as the main alternative to the government and pro-government media.) However, an informed analyst from Turkey whose judgment in such matters is highly trustworthy, and who knows Baydar personally, assures me that Baydar is neither a Gulenist nor an AKP mouthpiece but a serious journalist with genuine integrity and independence of mind (who at various points in his career has worked for newspapers in several sectors of the Turkish political spectrum). => By the way, I couldn't help noticing a curious little detail about the photo at the head of Baydar's article, which I've reproduced at the beginning of this post. 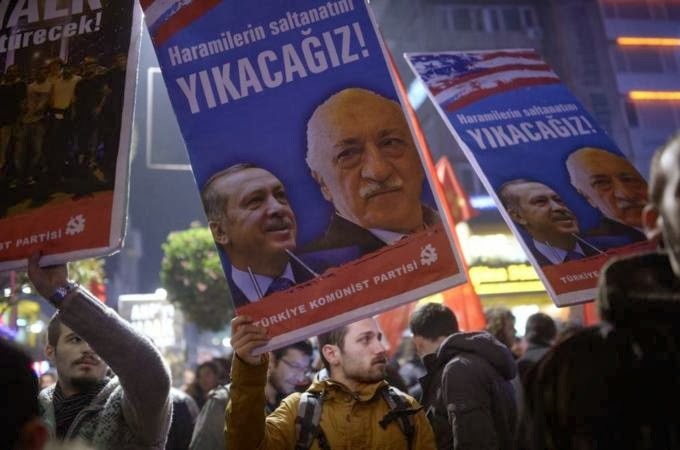 Someone on the Al Jazeera staff (who probably didn't know Turkish and wasn't paying close attention) decided to illustrate this article with a photo of demonstrators from Turkey's Communist Party, carrying posters with pictures of both Erdogan and Gulen and condemning them en bloc. Some people who do know Turkish were kind enough to help me out with a translation of the slogan on the poster. What it says (roughly) is: "We will destroy the reign of thieves." That strikes me as an admirable program, in principle, but I suspect their chances of success in this endeavor are not great. P.S. For more on Gulen and the Gulenist movement, including some intriguing US angles, see here & here. Erdogan v Gulen: Zero sum game? Once allies in changing Turkey's ultra-secular state structure, the two men are now at loggerheads. Yavuz Baydar is an award-winning journalist, commentator and a former news ombudsman. He is a columnist with daily Today's Zaman, Istanbul, and a blogger with Huffington Post. He covers Turkish politics and diplomacy, the Middle East and the EU, human rights, minority issues and media matters. In what looks like a perfect political storm, the vessel called Turkey is now in uncharted waters, increasingly adrift. During the last ten days that shook the country - following a police operation linked to a massive graft probe which involved four government ministers, an Iranian businessman and the CEO of a public bank, Halkbank, the ruling Justice and Development Party (AKP) government and the judiciary are now at what can be described as a full-scale war. The developing story has two layers. At the top, there are allegations of bribery, money-laundering, racketeering, and organised crime of immense proportions. If the accusations have ground, the suspects - two of the detained are the sons of government ministers - have received bribes that surpass $120m. In a so-called "second wave" graft probe, which was blocked by a stunning row between the government and the judiciary, one of the suspects is Bilal, son of Prime Minister Recep Tayyip Erdogan. As the corruption inquiries seem to engulf Erdogan's family, the confrontation between the executive and the judiciary has - perhaps expectedly - turned into an existential battle for the separation of powers, threatening the stability of Turkey. In the second layer, there is open warfare between two men, who, in their own way, have defined the course of the country, and its national brand of Islam - Erdogan representing its vertically political and Gulen its horizontally social side. Erdogan, who had accused an array of enemies - the interest rate lobby, Israel, international media, and business circles in Istanbul - as the real culprits behind the early summer's Gezi Park protests and general urban unrest, has now added Fethullah Gulen and his followers as the top player to oust him from power, claiming that "the gang" associated with Gulen's Hizmet Movement, has operated within the state, plotting against his rule. Gulen is a 72-year old reclusive cleric, writer and preacher, who lives in self-imposed exile in Pennsylvania, US, after being persecuted by the Turkish military's top brass in the 1990s. The old, ultra-secular establishment regarded him as a dangerously subversive leader; however, he is loved by millions of followers in and outside of Turkey for his staunch advocacy of a moderate, tolerant, modern brand of Islam, and peace and interfaith dialogue. Gulen preaches that education is vital in promoting a new version of Islam, and endorses a global movement to operate schools - now active in more than 140 countries. His followers in various business sectors - often small and mid-scale - have become key players, spreading around the world - comparable to Calvinists - to be part of the trade globalisation. In Turkey, Gulen encouraged massive social engagement, on a voluntary basis, for the support of democratisation and diversity. His pious civilian movement called "Hizmet"(Service), is present in media, academia, education, and the bureaucracy - security and judiciary. But it is the latter which has been at the focus of controversy - now at full display after the graft probe. Erdogan, who since Gezi Park tends to see enemies in every corner, openly targets those whom he believes are Gulenists among the police, prosecutors and judges. He seems so convinced that he reportedly threatened Hizmet, by saying, in private conversations, that it may be charged as a "terrorist organisation". Among his public accusations: There is a "parallel state" and those in the police and media are involved in "spying". This is Erdogan's well-known pattern that after such a long time in power, and unchallenged by opposition, he - reminiscent of Margaret Thatcher or Helmut Kohl - targets all the dissenters, and creates imaginary enemies to antagonise them in order to boost his popularity. Yet, although it partly and correctly explains it, there are deeper reasons behind the fallout between Erdogan and Gulen. After all, these two popular figures were allies in dismantling much of Turkey's ultra-secular state structure, which ruled for eight decades with the military the master sponsor. Erdogan had the backing of the Hizmet Movement in consecutive elections, in the trials of attempted coup leaders, and in a referendum that led to a patchy, but crucial constitutional reform, which radically changed the structure of the judiciary. But, for insiders, the fact of the matter is, the friction started to develop between the two men in 2010. And it has always had to do with two clashing views within the sphere of Islam stemming from the old traditions of Turkey. The first element had to with Erdogan's deviation away from Turkey's European Union membership aspiration. When Gulen, who has been vocal in supporting a civilian constitution, saw delays in the process, his patience grew thin. When the Gaza Flotilla episode in May 2010, ended with a tragedy, it was Gulen who, in a surprise move, criticised the violence. His blunt criticism, it was reported, was never "forgiven" by Erdogan. First, a deep division emerged on Erdogan's choice to conduct the so-called "Kurdish Peace Process". Erdogan's methodology was to negotiate directly with the PKK, both with its leader Abdullah Ocalan, and its "military command" in Iraq's Qandil Mountains. But, Gulenists, who see the PKK as the main adversary in the mainly Kurdish regions - as the PKK considers them - were discreetly dismayed. They argued reasonably, that Erdogan could and should focus on broader political reform, push for a civilian constitution and grant all the rights the Kurds of Turkey demand, such as recognition of ethnic identity, education in their mother tongue, and endorsement of local governments - without talking to the PKK. This approach, Hizmet's supporters argued, would weaken the PKK, because it would "disarm" the armed movement from all the reasons it continued to wage guerrilla warfare. The AKP and the Gulen Movement have never recovered from this difference of opinion. Finally, a series of developments brought the rift to new heights. Gulen never had sympathy for Hakan Fidan, the head of Turkey's Intelligence Service (MIT), whom he suspected secretly profiled his followers. When Fidan was summoned for interrogation in the probe of the PKK-related Kurdish Communities Union (KCK) network in February 2012, and when some bugs were later found in Erdogan's offices, the mistrust became visible. Hizmet started to see itself as the next target for Erdogan's action for submission. The last straw came months ago, when Erdogan declared that he would terminate all the private prep schools in the country, more than half of which were owned by Hizmet affiliates. And when he insisted on passing a law for their closure, all the remaining bridges were burned. The estrangement is now irreversible. The two lines are now on separate paths, and a historic bond, which previously broke down much of Turkey's rigid system, is broken. Is it a zero sum game? It's hard to tell. Yet, it would be simplistic to claim that it is a power struggle between the two lines. Gulenists are not in power, in the police or the judiciary: Both contain a wide blend of people. Thus, Erdogan will have a hard time to do a convincing "cleansing", considering that he is already facing accusations of a McCarthyesque witch-hunt. He will end up as a leader whose hunger for control knows no limits. Will the fallout effect the local elections scheduled for March 30, 2014? Two pollsters, who wish to remain anonymous, told Al Jazeera that unless dramatic changes occur in the economy, and unless Erdogan continues with his erratic behaviour, the AKP may end up winning, with a possible loss of 4 to 7 points. But, the 2014 elections in Istanbul demand attention: This is where anything can happen. Both AKP and CHP have strong candidates and if the AKP loses there, it may signal very bad news for Erdogan indeed.